We are able to offer an affordable laser cutting and engraving service to artists and designers (well anyone actually!) who has a need to cut or engrave a range of media. The only real restriction is that we are unable to handle metals (except engraving coated materials) and any material that contains chlorine or similar substances. The bed of our machine is 400 x 600mm and can handle a 12mm thickness for cutting. Designs can be supplied in a range of formats or we can convert your design drawings to suit. Please contact us for details of this service. We hold a stock of common materials and have access to supplies of others usually within a couple of days. Most work can be turned around quickly, depending on volume, but we will always give you a time scale when you place an order with us. We are particularly interested in experimental or development work (things out of the ordinary). For example we are currently working with an artist to produce some exquisite rubber stamps in large formats for reproducing her work. This stamp is created using eco laser quality rubber (green and green coloured) and is available in any size up to A3 at a reasonable cost. The rubber is mounted on 18mm MDF to enable the artist to use a standard lino or book press to imprint the design onto the media. 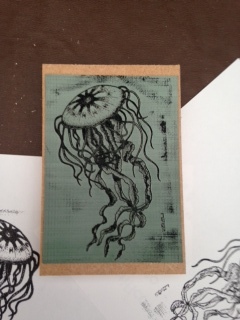 A stamp of this size is hand inked with printers block ink and a roller. Smaller stamps can be inked using a standard pad. The depth of the impression in the rubber can be controlled during the engraving by controlling the number of passes the laser makes. Fine detail is not lost as we use a ramp engrave setting which enables the fine detail on an image such as this to be supported by the backing and surrounding material.